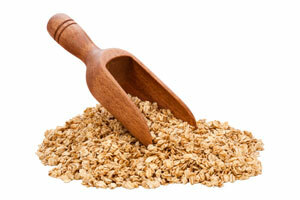 Oats are a cereal rich in soluble fibre and containing more protein than other cereals. Oats do contain some gluten, and are therefore usually considered okay for people with a wheat allergy—if pure—but are not recommended for a gluten free diet, although some coeliacs can tolerate oats in small quantities. Oats contain avenin, a protein similar to gluten, although it is present in small quantities it may not be suitable for some celiacs. The biggest issue with oat consumption for people with wheat allergies is the risk of cross-contamination at the processing source. Normally mills will process wheat, barley, rye etc. as well as oats, therefore sourcing wheat free oats is essential. Oats are extremely versatile and can be used to make porridge, flapjacks, wheat free muesli, granola, cakes, bread and cookies. Oats are also used to make certain beers and feature very strongly in traditional Scottish cooking, including Haggis. All oats will increase in quantity when fluid is added to them due to absorption, although each type—steel cut, rolled, instant, flakes, quick, flour— will absorb different quantities. If in doubt follow the instructions on the packaging or the recipe being followed. Each different type or grade of oats require slightly different cooking processes so it's worth following the instructions on the packaging or the recipe being followed to avoid disasters. Oats need to be kept in cool, dry, airtight conditions. The freezer is actually ideal for storing oats; simply bag them up (double bagging is recommended) then store in the freezer until they are required. This keeps them fresh for a lot longer than if they are left at room temperature. When oat flour is produced the outer casing of the oat has the germ and bran removed; oat bran is high in fibre and can be added to recipes to raise the fibre level and give it additional texture. Oat flakes are oatmeal that has been steamed and then flattened using large rollers, as a result flakes will cook a lot quicker than normal oats. Oats are finely ground to make flour. Oat flour makes very good oatcakes, but is generally combined with other alternative wheat free flours for most cooking uses. To make oat flour simply process oats in a blender or food processor until they resemble flour. Oat flour can go rancid so it's best to make it in small quantities as required, or store it in the freezer. There are different grades of oatmeal, pinhead, rough, medium rough, medium fine, superfine; each distinct type generally having a particular suited use, refer to packaging for details. These are oats that have been crushed and dehusked—not widely used outside of traditional Scottish cooking.